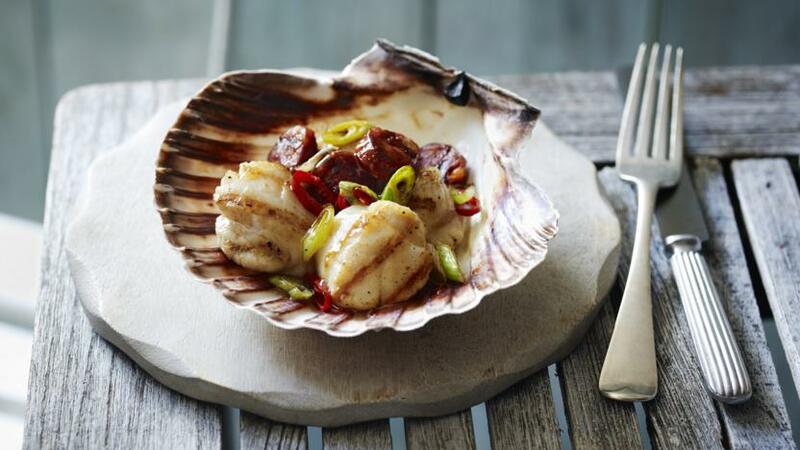 The combination of spicy chorizo and chilli with creamy scallops and a touch of honey gives this easy starter a sensational flavour. Heat a heavy griddle pan over a high heat. Fry the chorizo until it is browned and some of the juices are running in the pan. Add the spring onion and chilli and fry for 2-3 minutes. Add the scallops and fry for 2-3 minutes on either side or until cooked through. Drizzle over the runny honey and stir to coat. Divide the scallops and chorizo among the six scallop shells and serve.